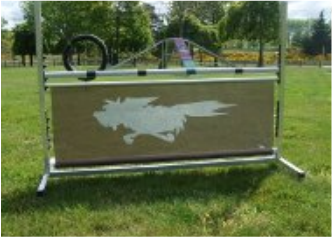 Approved by the Dogs NZ Agility Committee in 2013, for use in all competitive situations whenever "Brush Fence" is mentioned. It utilises a retractable blind attached to a galvanised steel hurdle frame. acceptance due to the extra safety of the retractable vision screen and the ease of storing a single item rather than the five separate items that is the alternative. Can be adorned with your club logo by spraying the image through a paper stencil. The concepts, designs and images on this site are copyright to Agility Stuff Ltd. The products offered on this site that are not made by us are similarly protected in the name of the manufacturer.